In a snap, Ford has decided to kill all of its and sedans and hatchbacks except for the Focus Active. While this may be a smart business move—for now—buyers looking for cheap speed and five-doors will eventually have to go elsewhere. Now seems like a good time to grab a Fiesta ST, Focus ST or Focus RS with heavy discounts. Of course, no one really knows what the future holds long-term for the ST and RS cars in America. It’s probably safe to say that the smaller Fiesta ST is gone for good, but it is certainly possible that the Focus RS could be revived and sold in small batches once its next-generation version eventually drops. But rather than wait to see what happens, buyers looking for a deal on the current crop off fast five-doors can score some impressive discounts. We’ll start with the tiny the Fiesta ST, one of the most fun cars you can buy at any price. There Ford is offering up $2,500 customer cash in addition to whatever the dealer is willing to do to move out those units. Since the margins on the small Fiesta are slim, the deals aren’t as dramatic as its larger cousin the Focus, but it is possible to pick up the little hoon-mobile for under $17,000. The larger Focus ST offers more space, more power, and more cash on the hood with $3,500 coming from the factory. And dealers are pretty desperate to clear out the inventory selling nicely equipped Focus ST hatchbacks for well under $20,000. That’s not much more than the Fiesta ST. If the ST models aren’t extreme enough, and your budget is a bit more flexible, the Focus RS—which will go down as one of the greatest hot-hatches sold on our shores—can be bought for well under dealer invoice. Remember when these things were being sold with markups? Hah! 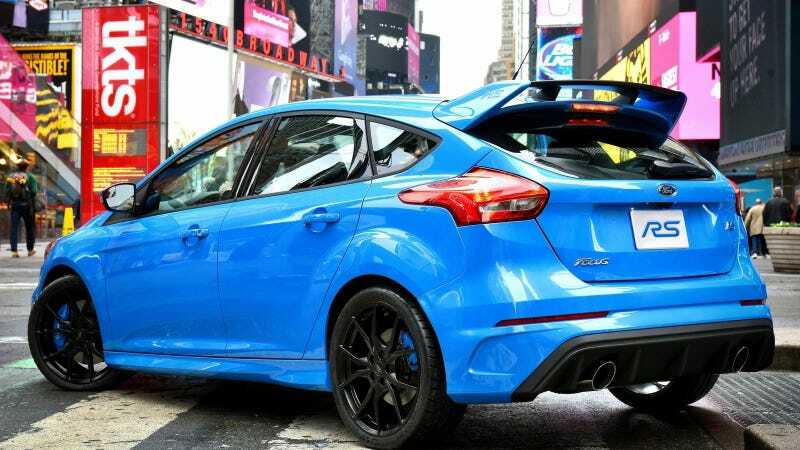 Under $35,000 for any Focus RS is the steal of the year. Calling it now. This is the part where I put my usual disclaimer of watch out for stacked rebates that you don’t qualify for and always get quotes in writing to know whether or not the advertised price is legit. So if you are upset about the reduction of small and fun cars in America, do your part and put one of these ST or RS models in your driveway.